The Pushkin museum on Moika, 12 became Mecca for admirers of creativity of Alexander Sergeyevich yesterday. In St. Petersburg as, perhaps, in Russia have in large quantities celebrated birthday of the great poet anywhere. Festive actions took place in St. Petersburg since the morning. 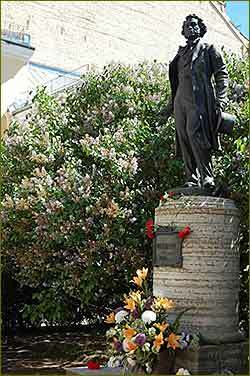 In the yard of the All-Russian museum of the poet classical music played and Alexander Sergeyevich's poems sounded. And in Primorsky district have opened the new art object devoted to the sun of the Russian poetry. Tatyana Bazhenova with details. Mozart's symphony performed by a governor's orchestra has brightened up long expectation of guests of the Pushkin museum today. Before an entrance to the well-known interiors the turn in several hundreds of meters has stretched. Till five in the evening it was possible to see the apartment and lyceum of "the slave of honor" absolutely free of charge. - We have arrived specially yesterday here to get, planned year. - For the sake of what? - There was a wish to see, stay exactly today, exactly here, and the daughter has name-day. There was a wish to combine everything. - It is possible also in the winter, but it is cold, and now it is good. You see, the sun left. He knows and feels that we support him, we not for nothing here come. Birthday of the poet 17 years - a holiday all-Russian. Date has received such status in day of the 200 anniversary of Alexander Sergeyevich. After June 6 declared also in the afternoon of Russian. Alexander Govorunov, vice governor of St. Petersburg: "Monuments to Alexander Sergeyevich are in other countries and even on other continents. In Rome, Seoul, Shanghai, Belgrade, even in Adds-Abebe. By the way, memory of our Russian genius will be revered today in the capital of Cameroon where begins work Book fat of the countries of Africa". The central event of day - Pushkin readings. On Moika comic poems "Lodge in Kolomna" and "Count Nulin" sounded today. Actors Sergey Migitsko, Anastasia Melnikova and Elena Rufanova have read unforgettable lines, directors of the largest city museums have joined them also. Nikolay Burov, director of museum-memorial "St. Isaac's Cathedral": "Pushkin is infinite because he is Russian. It not only literature, plots, is language which our country after Pushkin has started talking. Or, say, in Pushkin times. To him spoke slightly other language, it was heavy language of Derzhavin, Lomonosov, Sumarokova". The new art object devoted to the sun of the Russian poetry was opened on the Black small river today. On Savushkin Street the square under the name "Pushkin Has Left" has appeared. In the center of composition - a bench on which the raincoat of the poet hangs his cylinder, the open book and a feather lie. As it was conceived by the author of the project Valentin Petrenko, installation has to make impression as if Alexander Sergeyevich had just a rest on a bench in a shadow of trees and for a minute has left. Nikolay Tsed, head of administration of Primorsky district: "We will always come to this place because this place is a new riddle. A new riddle which each of us on the will guess". Near a bench have established a stone, on it the fragment of the poem of Pushkin is cut "on October 19". Have executed a memorable sign completely on extrabudgetary funds. To birthday of the poet the gift to the city was given also by a praprapravnuchka of the brother of the poet Olga Ilyina. The St. Petersburg artist has opened own exposition. However, on cloths you won't see Pushkin. But among works - Peter I and Catherine II's bright comical portraits. Such style, according to the author, precisely would be to the taste to the legendary ancestor. Olga Ilyina, Lev Pushkin's praprapravnuchka: "It is the works performed in technology of painting on Levkas. It is Old Russian equipment, icons are so written. And here just secular such plots". With opening of other exposition - Jurij Cooper's works - celebrations of Pushkin day just have also come to the end. On Moika, 12 have presented a collection of the black-and-white cloths devoted to St. Petersburg. In the name of an exhibition, certainly, the Pushkin quote: "There once also I walked". Guests will be able to see the favourite city of the great poet on cloths since June 8. Culture news archive for 07 June' 2016.